Human body sensing night light, it will automatically light up in the dark when the movement is detected. And it supports intelligent light control, when the surrounding light is strong enough, it will automatically go into the dormant state and will not light up. The sensing angle can up to 120 degree, and sensing range is 3-5m, and it will automatically turn off after the human body leaves the sensing range about 20s. 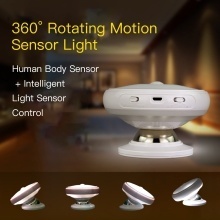 360° rotation body induction night light, allowing you to adjust the lighting direction and lighting angle arbitrarily, very flexible. The both front and back side is equipped with LED light, and there are 3 modes(AUTO/ON/OFF) for you to choose, so you can select the suitable one via pressing the button based on your different using needs. With detachable magnetic base, easy to install, no any plug or wire needed, very convenient to use. The light also can work as a flashlight or emergency light(in the ON mode) when it is removed from the base, very portable. It will provide soft and bright light with long working life, energy-saving & environmentally friendly. Suitable for using in the children room, bedroom, bathroom, kitchen, wall, stairs, hallways, closets, cabinets, etc. Note: Please charge the light for 2-5 hours before first use, and when fully charged, the indicator light will turn to blue from red.